The modern and effective way to control and clean up spills, particularly those resulting from liquid fuel deliveries. The Road Traffic ( Carriage of Dangerous Substances in Road Tankers and Tank Containers ) Regulations 1992, require that during the delivery and unloading of petrol, a suitable quantity of absorbent material must be available as a contingency against spills. 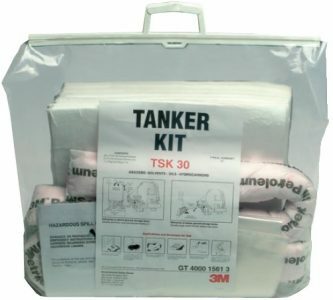 Tanker Kits made by 3M can satisfy the above legislation ensuring a rapid and effective solution to spills of this nature. Absorbs solvents, oils and hydrocarbons.